No reservations needed, just come in! We take reservations for group of 5 people or more only. 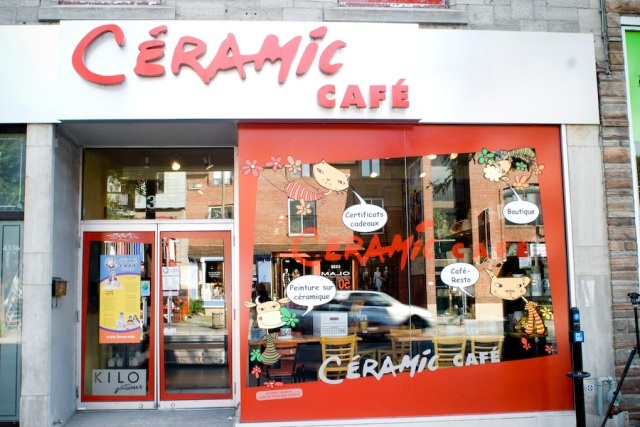 The Ceramic Café on St. Denis Street in Montréal is the first Ceramic Café to open in Quebec in 1997. Since 2007, it has been at 4338 St. Denis Street, at the intersection of Marie-Anne near the Mont-Royal metro stop. Previously, it had been on the other side of St. Denis Street at the intersection of Rachel Street. The owners and creators of the concept, Paola Cacopardo and Gilles Geoffrion, are the owners of the five Ceramic Cafes. The Ceramic Café in Montréal is made up of 2 floors and can accommodate up to 100 people. The team of Ceramic Café of Montréal is available as far as in Gatineau to offers ceramic painting activities to groups such as school, enrichment programs, summer camps, office parties, bridal showers, children’s birthday parties and other occasions. Since its opening in 1997, people have gathered at Céramic Café-Studio. You can be a novice or an accomplished artist, solo, with family or friends; you can paint unique ceramics, personalized and useful in everyday life. Our paninis are famous, our smoothies and our coffees comforting. © 2016 Agence Oz. All right reserved.